So, let's get some paper and pencil and dive right in. Okay, so you are to go? What is the first one? (We have 364 more to go, so this should not be too hard, right?) Aehm... are you drawing blank? Don't worry! Let's start with something you know a lot about: your customers. What are the most frequently asked questions they ask you? What hesitation do they have before hiring you? Are there any questions you get over and over again? 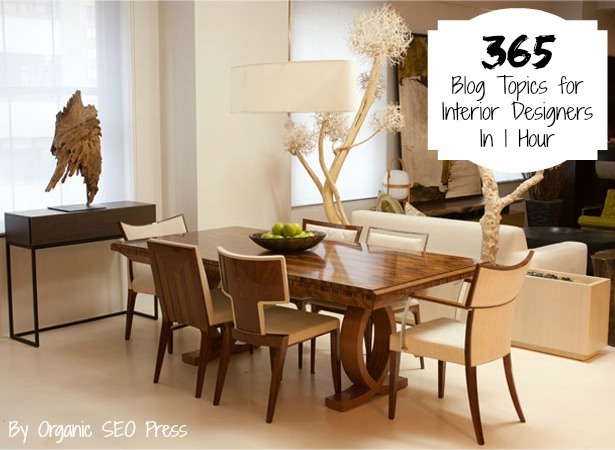 Interior Designer On A Budget - Can I Afford To Hire One? Now that we took care of frequently asked questions, let's inspire our readers. Or the kids room topic could include nursery, baby's first room, big kid room, girls bedrooms, boys bedrooms, teenager rooms and college kids rooms. Let your imagination wonder and come up with two blog posts for each sub category. Now you have about 150 blog topics. But we are not done yet! You can take the list from above and drill down even further adding an additional angle. Now you can dive deeper and add more flavor to your topics. By taking a broad subject and adding a seasonal aspect, a style or budget into the mix. Group your blog posts as you plan them out and then tag them. Once you have hundreds of blog posts, its easier for your reader to navigate and keep them engaged on your site. For example, a reader came to your site because she found your post "Plan Your Baby Girl's Nursery - In 5 Easy Steps", she might also be interested in other posts related to that topic. How long would this project take someone to complete? What projects can be completed within 20 minutes, in one hour, one day or over the weekend? Include holidays and seasons, such as Easter, Passover, Spring Break, Thanksgiving, Christmas, and New Year's. Tackle Your Basement - How one weekend will get you organized! Your audience might not always know exactly what the style is called they are going for. Or that their latest ultra modern living room design ideas clash with the character of their beautiful Tudor house. You could start off with "The Ultimate Guide to Design Styles". That is a great corner-stone topic for you to always link back to when writing about this topic. Who are you talking to? Are you serving high-end clients who pay you to design luxury spaces? Budget still is important to them - but on a very different scale than a middle-class first time home owner who just invested all her savings in the purchase of her house and is looking for some cheap DIY projects. For a high-end client, you can consider topics such as "Is a Kitchen Remodel Really Worth It?" and "How to Make Sure Your Interior Designer Stays On Budget". 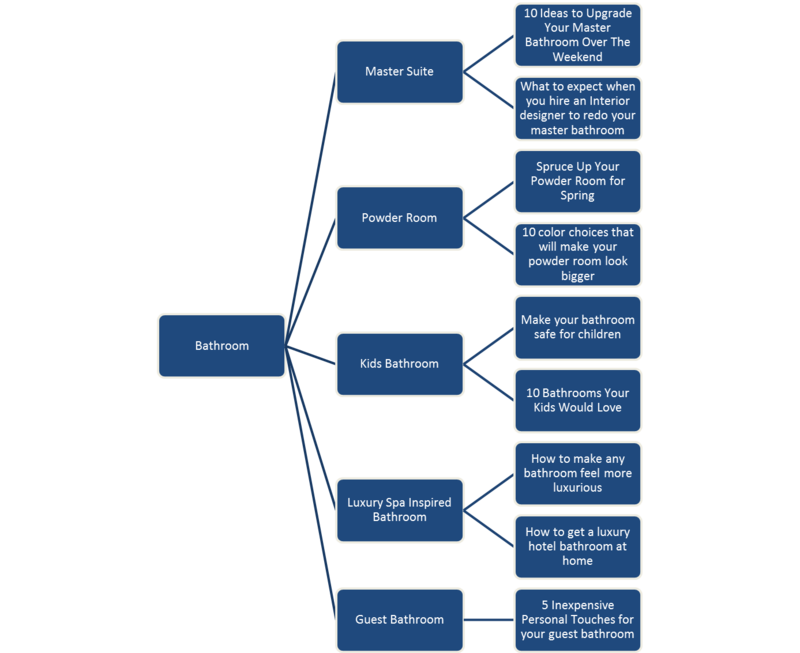 If your clients are more the first time house owners, topics like "The Value Of a One Hour Design Session" and "5 Inexpensive Bathroom Makeovers" will hit home. I am not saying you should write the "How to Be An Interior Designer And Take My Job" here, but giving very precise and valuable tips and ticks from your own Interior Design Book is essential to show off what you are made out of and establishes trust in your ability as a designer. Many of those topics are material for a mini-series of 4-5 blog posts and one summary post. You can write the summary blog post first and then dive deeper in each of the subsequent posts. But do not forget to link to all related posts internally. Curating content is a content marketing technique that packages already content in an exciting, useful or new way. You can use your own content or other pieces from Pinterest, Interior Design websites, etc. Make sure to always link to the original content and give them credit. But this is also a great way to reuse your old content and revive it. Make it a habit, to ask your clients if your could write a blog posts about their finished space and the project itself. Take pictures of the space before you start, write about the pain point or the design challenge you client was facing, how he found you and what you turned the space into. Feature (and link back to) the furniture designers that you used or the Houzz idea book that inspired you. Make sure to include beautiful photos in each of your posts. Do you have 365 blog posts by now? Or are your still missing a few? If you need a little more inspiration, you can always try the Hubspot Blog Post Generator. Now you should group and organize them, plug them into your editorial calendar and read up on how to avoid the 10 most common blogging pitfalls. *Photo Credit: Cliff Young Ltd.